Whilst liaising with Technical Print Services, you will follow a quick and simple process; from initially sending over your desired artwork, through editing and approval, to finally printing, quality control and dispatch. We guarantee that you will be completely satisfied about how your final product will look. Once you have sent us your desired branding, our Graphic Designer will digitally add this to the product and send you an Artwork Approval Form (Below). If you are uncertain of how your artwork will look, this free service can help put your mind at ease. Although it would be great for all artwork to be sent in Vector Format (AI, EPS or PDF) and fonts converted to outlines, here at Technical Print Services we understand that not everyone has their own design software. If you are unable to supply your artwork in this format, please don't worry as we can help you with any problems you may have. If you like the digital representation we have created for you and have given us the go ahead, we will allocate your order to a machine and an operator as well as allocate a printing date, usually within 3-5 working days. Next, we will prepare your artwork to be printed. This includes everything from unpacking, photopolymer plate creation and preparing the product. 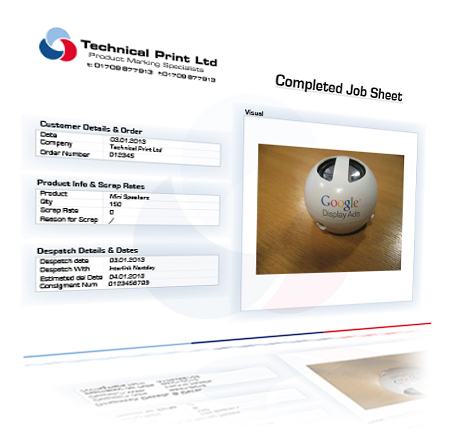 To ensure that we achieve the highest printing standards, we perform frequent quality control checks (below). 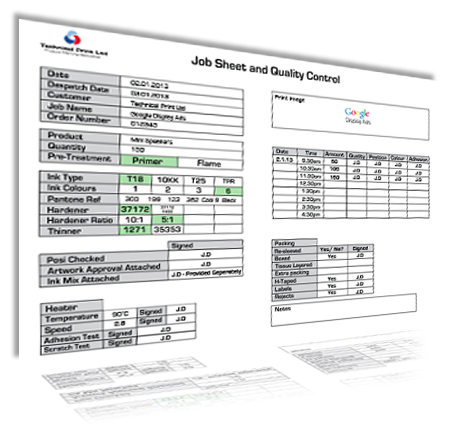 This involves analysing all products to ensure print consistency throughout the order. Should we see any irregularities, we will address any issue immediately and take appropriate action. We also perform an adhesion test to check that the print does not rub off easily. If it does, we will cure the product artwork in our specialist tunnel dryer. 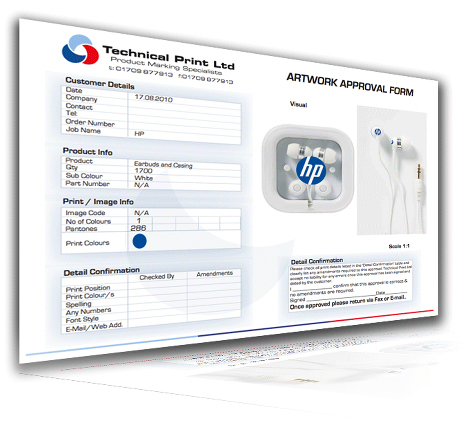 If you have several orders with us at Technical Print Services, we will keep you regularly informed about them all via our order update sheet. This allows you to view each order status from artwork approval through to a final dispatch date. Customers may also keep any product stock with us that is controlled via our automatic monitoring system. For further information about product storage please call us directly on 01709 877 913. After printing, we will prepare your products for dispatch, carefully packing your order and organising it for delivery. Upon collection from our dedicated next day courier, our art-worker will send you a job completion sheet (above) with details about your printed products, a photo of your printed product and a consignment number (if applicable) so you can track your order during transit.